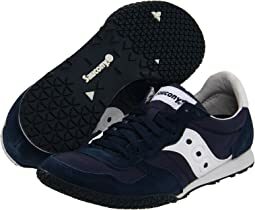 In 1977, after many long years being kept a close secret, Saucony men’s shoes and Saucony women’s shoes were recognized by a small group of serious runners and received an award given by a US magazine. 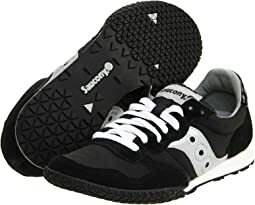 Years of innovation and technical enhancements have allowed Saucony shoes and Saucony clothes to garner a reputation for high quality. 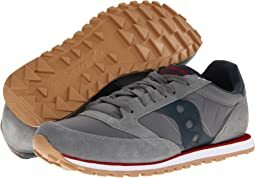 Yet Saucony men’s and women’s shoes expand well beyond their running heritage. Saucony Originals take you where you are headed without forgetting where you came from. Four years later, the Saucony Jazz O was launched and today is the most beloved of all Saucony Originals and lays the foundation for the Saucony men’s and Saucony women’s Originals collection. 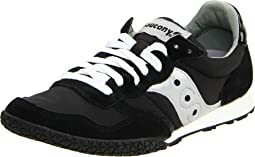 As Saucony running shoes move forward and continue to be depended upon for their leading technical advancements, there is a renewed dedication to the retro fashion category that is Saucony men’s Originals and Saucony women’s Originals. 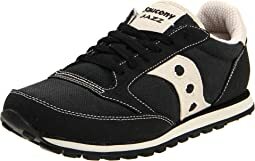 The Jazz O is the centerpiece but it is flanked by classic Saucony shoes from the Courageous to the Shadow 6000 that together have played a significant role in the history of Saucony men’s Originals and Saucony women’s Originals. Experimenting with colors, textures and materials yields new looks and choices but Saucony Originals’ lines remain classic. 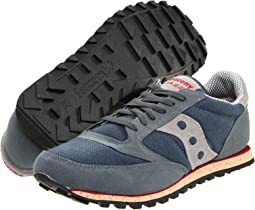 Saucony men’s Originals and Saucony women’s Originals are for those of us who don’t want the same shoe everyone else has. 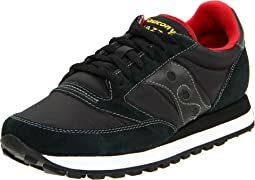 Zappos.com and Saucony Originals can take you anywhere – whether you are chasing after a cab, walking ten blocks after last call or simply straddling a few decades. I am happy with these shoes. They are comfortable, fit perfectly, and look great. The soles provide good traction, too. The only problem with them is that they squeak with every step! I purchased a size 13. This size has never been small on me. This pair was uncomfortably small on me. I love these shoes! I ordered the slate/cream color and they look great. I am normally a size 8 and the size 8 fit me perfectly. They look very stylish and are comfortable as well. So glad I bought them! Love these shoes so much. I bought another pair in a different color. Size 13 in the light blue/yellow was 1 inch smaller than 3 other pairs of Saucony Jazz I have. Just a heads up. I have been wearing these shoes for 17 years. Call me a creature of habit. I wear them about 5 days a week, 8 hours a day, and go through one pair per year. They are perfectly utilitarian for a walking or non slip proof work shoe- lightweight, comfortable for a moderate arch, relatively inexpensive- and have a simple, classic look. My go-to sneaker. Love these shoes. Super stylish and very comfortable. I ordered this a touch bigger to accommodate my orthotics. These shoes and my orthos are a dream team! The shoes themselves are cool looking and have a nice cushioned sole - I'll bet I would have loved them without my orthotics too. I love the bright colors and comfort of these amazing tennis shoes! I struggle to find shoes that help my feet and ankles not to tire out mid day as an elementary art teacher. These are comfortable for all day and cute. I’ve had them for 8 months now and they are still perfect. I wear them at least 3 times a week. They also wash up nicely in the washing machine, which is important for an art teacher. These felt disposable. For the price I guess that's valid. So very comfortable. The upper was foam-like, the lower was unappealingly bright white. Reminded me of the first generation Reebok track shoes from the early 80s. Seem great for kicking around the house, or for extended walking or standing. I was looking for something durable for summer activity though, and a few minutes in these did not inspire confidence to that end. Love these shoes. Like a hug for the feet. Lightweight but still supportive. True to size. Would definitely buy again. These are very light, very minimal shoes. I love the style and the build of the shoe. But I suggest to order a half size up. These are great for daily walking! I like them but a snug fit. I will probably not be able to wear socks. Love these shoes! They're exactly what I wanted, and reasonably priced. These are my new Mom kicks. Meaning: I'm wearing them to playgrounds, grocery shopping, kid drop-offs, etc. I'm not running in these, so that's not what this review is about. But they're perfect for chasing kids and errands. Best part: very affordable. And they match all my athlesiure wear. Super light weight, most comfortable shoes ever. They wear out kinda fast (~a year) but maybe that's because I don't wear anything else! I loved my first pair of these years ago so I bought a second. They’re a great low-profile, stylish, retro-looking sneaker. However, the quality control on this shoe is very poor. The color and texture of the suede is inconsistent from pair to pair, the edges on the side detailing and tongue tag aren’t always cut clean/straight, and the edges of the sole aren’t glued well in some spots. That being said, at just over $40 I’ll probably just wear these out and buy a replacement pair in the future. I've bought many pairs of these shoes over the years and they've always been great. They are true to the size. Good classic style of shoe. They are velvet/suede so they might discolor due to wear. I bought these for hip hop and they have just the right amount of slip and grip for sliding and sticking when you need to! They aren't bulky, but still give you support and cushion. I like how the toe/ball of foot area doesn't have a ton of "squish" under it so you can feel and control what you are doing. And, the heel area has all of the squish of a low grade running shoe, which is what you need for support, stability, comfort and injury prevention. Too much squish and you lose "dance-ability" in a shoe. Too little squish and you end up with injuries. I am a runner and I've tried dancing in bulkier running shoes and it just doesn't work. These fit the bill for hip hop. 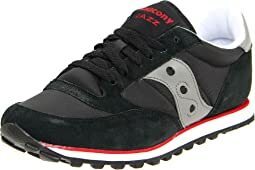 I also did a quick/short run in these once with my daughter when I first got them and I wouldn't recommend it at all. There isn't any shock absorption in the front and that will transfer to your joints and spine over time. I hope they never stop making this style! I am always an 8.5 and these fit perfectly. 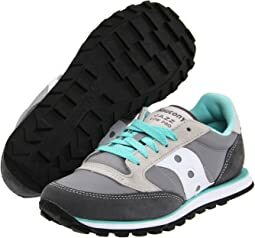 This was such a cute show and I'm new to Saucony, but it felt just too 'low' in the back and sides to stay on my foot even though the show itself was a snug, good fit. do have a narrow heel and quite high arches... Really cute but just not a good fit for my feet. I first purchased these shoes for myself several years ago. Now, I decided to buy these shoes for my mother and she loves them. She says that they are so comfortable and just the right size.